What Do We Do When There’s No Mirror around??? We are the world’s arms. We are the caretakers of human hearts. We are natural lovers. But today’s modern world has confused many of us as to who, and what, we’re meant to love. This is a time of self-love. Well, we should love our self. Why? Because we know exactly who we are. And it’s who we are that gives our lives meaning and purpose. Both men and women spend lots of time looking in mirrors, but there is much more to us than what we see there. Our true image is far beyond the mirrored one. The mirror, like the world, would have us see our wrinkles, a bad-hair day, or the extra twenty pounds we don’t want. The mirror says we have to do something about the way we look to others. It doesn’t show our true self. The mirror doesn’t see is what’s inside us–all that makes us who we are. Our memories, our intellect, and every choice we have made, and will make, through our free will. These are gifts directly from God that either show, or do not show, the authentic person we are. We are not meant to be God’s beauty queen or His handsome prince. We are meant to love. We are meant to act, and act lovingly. We are the message of His love in our world. And that is not something we can see in a mirror, but something we do when there is no mirror around. No Good Shepherd?? That Spells Trouble. Two years ago, my husband and I went to New Orleans to see one of our grandsons in “The Music Man,” playing the role of the infamous Professor Howard Hill. Then, our grandson was a junior at Jesuit High School. Now he’s a freshman at Catholic University, studying Theatre Arts. I will never forget The Jesuit High School production. It was fabulous, and so was my grandson. 🙂 You can see from the above picture how professional it was. 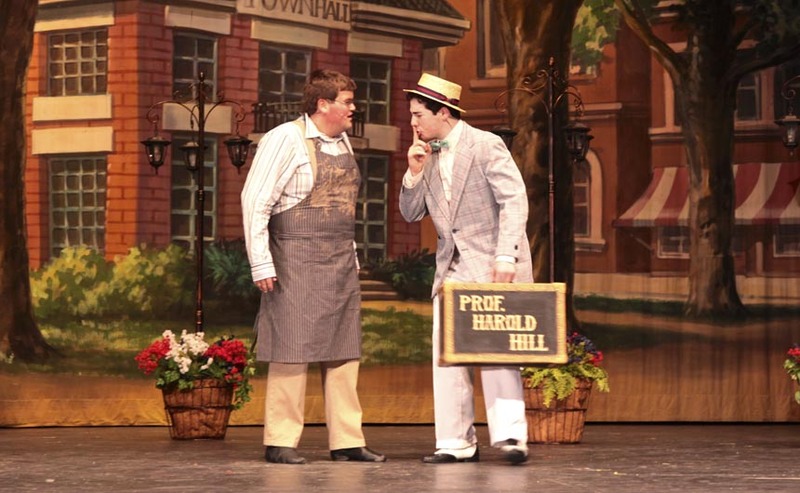 From the onset of the play, the audience instantly recognizes Professor Hill as a Con-man who gains the trust of a small town in order to sell them a bill of goods (in this case, band instruments) and make money for himself. Of course, in the end, he changes his tune, so to speak. The very successful Broadway play was the fantasy of American composer, Meredith Wilson. But in real life, con-men, or women, are not fantasy. There are many, and they are real. He or she is a practitioner of confidence tricks–an attempt to defraud a person or group after first gaining their confidence, used in the classical sense of trust. He/she makes himself a false shepherd that people will follow. And next, he or she exploits the characteristics of the human psyche such as dishonesty, honesty, vanity, compassion, credulity, irresponsibility, naïveté and greed. If we practice awareness, we’re able to see con-men all around us. We deal with them everyday in our government, in business, and perhaps even in our own families. They stir up trouble and create distractions so that their selfish ways can be accomplished. A fanciful Con-man (or Con-woman) is great fodder for a play or musical. But a real Con-man is dangerous. This so-called shepherd of the people, does not genuinely work for, or care, for his sheep. He works only for himself and leads people astray to accomplish his personal ends. Today, more than ever, we need good shepherds to lead our government, our businesses, our families. And I pray that we find the persons to do that–and that they will mirror our ultimate Good Shepherd, whose grace is always present, and available to everyone–even to the worst of Con-men. I am the good shepherd. If we believe there is a God who created each of us, then each of us is a child of God. And each human person has the divinity of God within him, or her. We call this divinity within us, the soul. It is the only part of us that doesn’t die. That makes the soul, and what happens within it, essential. As Faulkner says, the soul is spirit, just as God is spirit, and capable of great compassion, enormous sacrifice, and inexhaustible endurance. We see these capacities expressed in many good people that we know, and sometimes we express those same qualities ourselves. But often, compassion, sacrifice and endurance are not expressed by a person’s spiritual nature. Sometimes, he expresses the opposite. To an author, this is food for a story. This is the opportunity to illuminate the battle between good and evil as Faulkner and many other writers of substance do in their work. Because there is today, and always has been, a battle between what is inherently good, and what is inherently evil, it is natural for an author to write about it. In a story, this plays out in particular characters—-people like us who struggle with what they believe is right and what they know is wrong. All of this happens in the soul, where our intentions lie. And we either shine our soul, or sully it, by our various decisions to accept good, or evil. Most of us don’t like to hear that we can choose between good and evil. Some of us don’t even recognize evil anymore. We can’t put a face on it because today’s humdrum, saccharine tolerance for ‘anything goes’ has blocked it out and blinded us to the better call in our own souls. But a thing is not good or evil because it’s trendy or popular. I think, deep down, most of us know that truth is truth. Deep down, we know that absolute Truth endures, that it is not relative to public opinion, and that it is a twin of immortality. For me, it is most important for a writer to remember that, too. A seesaw is a long, narrow board pivoted in the middle so that, as one end goes up, the other goes down. A person sits on each end, and they take turns pushing their feet against the ground to lift their side into the air. 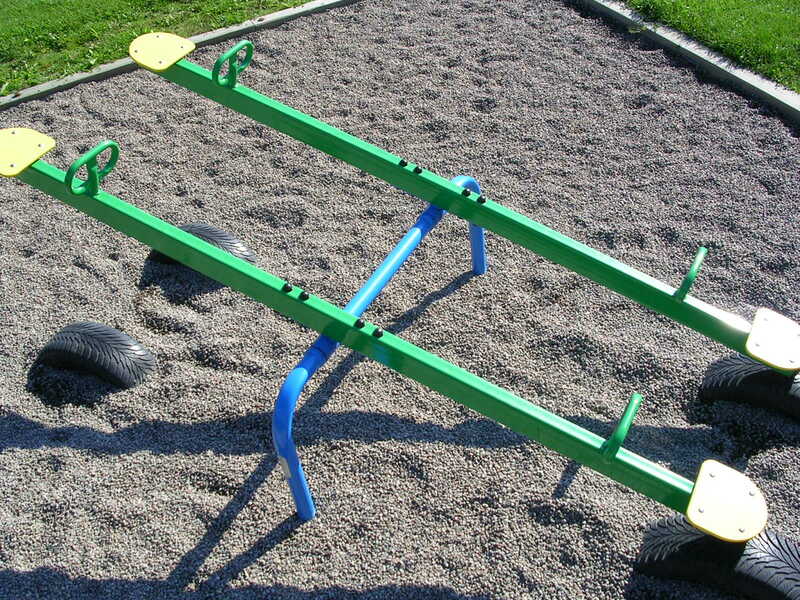 Playground seesaws usually have handles for the riders to grip as they sit facing each other. Life is like that, isn’t it? We face each other. We go up and down. Up and down. One minute all seems right, the next minute our world comes crashing down. It might be divorce, death of a loved one, debilitating disease, loss of livelihood, a dream gone wrong, or hurtful words or lies, targeted at us by another. Or we may be the one who brings down our own world by the bad choices we make. We are made to be people of goodness, but sometimes we corrupt ourselves through addictions, hanging around bad company, forgetting who we are—-children of God. We are on a dangerous end of the seesaw then. We might think it’s over for us. But we should never give up trying to find our balance again. One problem with a seesaw’s design is that if a child allows himself/herself to hit the ground suddenly after jumping, or exits the seesaw at the bottom, the other child may fall and be injured. For this reason, seesaws are often mounted above a soft surface such as foam or wood chips. In other words, a soft place to fall. Because in life, we will certainly fall at one time or another. None of us is perfect yet. All of us here on Earth sin against our innate goodness. And in doing so, we condemn ourselves. Still, don’t give up. Strangely enough, God doesn’t condemn us. He forgives when we ask Him to. The softest place for us to fall is into His merciful and loving arms. Need Mercy? You Have it. How you ever wished for an imaginary “help button” that would give you immediate assistance with a significant problem? Well, you do have one. You have the mercy of God. What do we know about God’s mercy? Have we seen it work in our lives, or do we notice it at all? Do we notice that despite our sinfulness, God still loves us–and waits for us to love Him in return? Think of the parable of the merciful father whose son returned to him after taking his inheritance and squandering it. Always, the father is waiting for his son to come home. Finally, when he catches sight of his wayward boy slinking back because he has no place else to go, the father runs to meet him with joy, despite what his son has done. Did you know you are loved like that? You are loved by God. Do we think our sins are too big, too disgusting to be forgiven? Are we afraid of what God might do to us because of our sins? But again– He loves us. I am certain that He will do nothing except love us–loves us through our sins, and His love will rid us of them if we let it. Trust in that. Tired of Doing What God Asks?? On Wednesday, I blogged about strong women, because strength is required to follow God’s will. God sometimes asks more of us than we think we can do. But there is a battle going on today. To give up, to quit, is not an option for a woman of conviction. Except, sometimes even mothers get tired of trying to do what they feel is right. Sometimes they, too, want to quit. And sometimes even strong women worry about what others might think. So, we need to have courage. We need to be brave. We need to remember that God is with us. Our battles may not be large ones. Maybe no one else will even see them, except us. Still, this does not mean we should back down from the Truth. We will always have help. But this is a matter of Trust. Trust in God is often difficult, especially when one faces a politically correct crowd armed with today’s accepted lies. What can we do then, except to disarm the lies by shining out genuine Truth? This is not done, however, with meanness and deceit. We cannot lower ourselves to such tactics. It is done by showing and emulating in our personal lives the beauty and truth we believe in. And emulation can only be done by keeping Faith. Joan of Arc’s strength came through her Faith. On trial, before she was burned as a witch, she said this: You see there is no strength in me, and no strength in my hands. There is no strength in any of our hands great enough to win against the English. Our strength is in our faith. And if our faith is eaten away by little things that God hates, then, though there be a million of us, we should be beaten back and die. Today the mountains we are asked to climb are high and hazardous. But we are here to climb them. We are here to live out–and shine out–God’s word in whatever situation we are in. To Be Myself, or Follow the Crowd?? It’s so important for us to be our “own person,” to know ourselves and commit to what we believe in. And important that our beliefs come from a thoughtfully informed conscience, not the politically expedient trend of the day. Each of us acts based on the sort of truth we allow ourselves to accept–genuine Truth or a concocted, self-serving truth. During Holy Week, we were reminded of the kind of truth Pontius Pilate accepted. Pilate took the word of a crowd as Truth, even though he thought Jesus was innocent. Then he washed his hands of the situation. Pilate was a material man. He knew what was right and may have been anxious to do it–as long as it did not interfere with his own interests. He would gladly have acquitted Christ if the crowd had called for it. But once his own position was threatened, he gave in. Pontius Pilate ignored his conscience. He would not listen to good advice of his wife. He chose his political career over what was right. He chose political expediency over integrity. And worse, he failed to recognize the truth even when Truth was standing right in front of him. It’s often hard for us to step out of our comfort zone and be courageous enough to stand up for what WE believe in. When the opportunity arises to express our faith in the Truth of Jesus Christ, will we speak up? Or will we be quiet and follow the voice of the crowd? Then Pilate took Jesus and had him scourged. And the soldiers wove a crown out of thorns and placed it on his head, and clothed him in a purple cloak, and they came to him and said, “Hail, King of the Jews!” And they struck him repeatedly. Listen Women. Are You Strong Enough to Stay??? There are women who stay the course when things don’t go as they expected.These women are beautiful and plain, young and old. They are loving women who do not give up. There are many of them, but they do not carry attention-getting signs so they often go unnoticed. These women do not destroy. They create. They do not cause disruption. They effect peace. They do not hang to some slogan created by someone who wants power only for themselves. These women are not self-serving. They serve others by choice. And they will NOT be used. They are the women who choose to raise strong families committed to God. They are women whose children or husbands become ill and become dependent upon them. They are women who may be so hurt by the actions of a family member that they are tempted to give up and leave. Yet they don’t leave. They stand strong because they believe in a higher purpose. They are principled women who adhere to life and their place in it. They are fighters. It is generosity that bolsters them, and genuine love is their weapon. These women may pray change will come. But if change does not come, they are courageous enough to change themselves enough to face their situations. They make themselves even stronger. They straighten their backs, tuck in their tummies, and lift their chins. They do not back down from the promises they have made. They walk toward those who would ridicule and demean their purposes, and like warriors, they challenge them. These are the women strong enough to stay. If an singer/songwriter wanted to make a statement about women who stay, it couldn’t be better than this one. A custodian is defined as person who has responsibility for or looks after something. Synonyms are keeper, guardian, steward, and protector. Most of us realize that we are custodians of the Earth, guardians of the forces and processes that produce and control the balance of Nature in order to protect it. The prospect of global warming is one aspect of this protection that is currently touted as if we can do something about it. And there are many more which scientists struggle to understand. But there is a higher nature here on Earth, a nature more vital than even the magnificent universe. And that nature is the nature of a human being. The nature of a Man or a Woman is actually more profound than the puzzling workings of the universe. Shouldn’t we protect and guard that nature as well? First, we have to understand what the nature of a human being truly is. We have to understand who we truly are and why we are here at all. We are more than a product of our environment, more than a highly evolved animal. We are creations of God, as is the universe. BUT we are the highest of God’s creations. In fact, we are made in His image and likeness. This does not mean that we look like God. God is spirit. But it does mean that we have inherited His spirit within us. His Holy Spirit. Because of this, our human nature has definite capabilities that are not found in Earth’s nature, or even in the nature of animals. In our human nature, we have a memory with an imagination in which we possess the capacity for mercy and compassion. We have an intellect, through which we possess the capacity for faith and humility. And we have a will, by which we possess the capacity to love. But how much emphasis is put on the guardianship of this kind of nature, our human nature? Not much. Instead, we act as if we are inconsequential, and nothing special. What poor custodians we are of God’s greatest creation! The fact is our individual human nature is beyond magnificent–and the only nature we can do anything about. We can’t change the nature of the world. We can’t stop hurricanes or earthquakes, floods or droughts, or even global warming. But we can change ourselves to become more in line with what God intended a human being to be. And we do this individually, as God meant it. Because each of us was chosen by God to exist. Before time began God chose each one of us and this choice was deliberate. God saw all the possible human beings He might have created throughout the history of the world. Out of possible billions of human beings that might have existed in God’s mind—His Eye rested on each one of us and then stopped looking and said, “You shall be.” He saw all who could have been and decided they would not be. His providence placed us in a time and state of life that would bring out our greatest potential.–Mother Angelica. We were chosen because He loved us and meant us to freely love others by memory, intellect, and will. And yes, we can choose not to love. Choice is necessarily a component of free will, with memory and intellect to keep the consequences of our choices in balance. He made our natures more than the earth–the earth is made for us. We are to protect it–yes. But more so, we are to protect, guard, and be custodians for others. All this, for our greatest purpose. Immortality. How important our human natures are when we look at it this way! How can we not do our best to protect it? We ought to stop and think. We ought to remember that we are the custodians of God’s most beloved creation–ourselves and our neighbors, His image and likeness on earth. And not just occasionally in a ‘feel-good moment,’ but today, and every day until we are called back to Him. If we are not doing this, if we are not trying to use our memory, intellect, and will to guard against the failings of our own human nature, then we cannot call ourselves custodians–or Christians. So, if we see ourselves becoming what we know we should not be, we should quit hiding from the truth. We should take truer look at ourselves and the genuine beauty of our human nature, and remember our kinship to God. Before the recent Alabama storms, I planted a garden of mostly herbs because I love to cook with them. For years, I’ve grown them in pots on my patio. A couple of months ago, just outside my kitchen, I had a dead tree and its roots removed. The area of turned earth seemed the perfect spot for a small herb garden, so I began one. I put in some older plants that survived our very slight winter, such as rosemary and chives. Others were new; lavender, a few marigolds, one tomato plant, and a young lemon tree. Some were seeds I had harvested and saved from last year’s basil and oregano. I planned where I wanted the seeds to come up and set them there. But it is a fact of Nature that seeds do not always bloom where they are planted. Storms happen, and even the best planned garden can be ruined. The power of water can transport seeds to unintended, even odd locations where one might think the seeds would never survive. Yet they do. Healthy plants often emerge through cracks in a concrete driveway, from between patio bricks, or in other uncommon places well away from a gardener’s intention. And they are just as beautiful, just as useful, here in this other place. It is the same for us. Each of us have personal intentions for our lives. We have our dreams, our goals. Then come the unexpected storms of life that carry us to places and through circumstances we would never have chosen. We begin to suffer, and may wonder if we can survive. We pray that our troubles, our cross, whatever it is, will leave us. But the storm does not appear to stop. So, we become angry, or depressed. We wail and cry. We don’t deserve this storm! Then we allow ourselves to become victims. And victims do not bloom–anywhere. The alternative is to accept that we have been crushed by a weight too strong for us to survive on our own. This is complete surrender, but do not confuse it with giving up. Because if we allow it, this will be where grace takes over, where God’s mercy is shown to us. This is where a new door opens, or a different way is revealed to us. This is when we trust, and where we cooperate with God’s all-knowing love. The fact that we don’t want to be where we are does not mean that we will not survive, and grow, and thrive in this different situation. Today, we see only our present trouble. But tomorrow is where hope lies. This is truly what it means to be a Christian. This is truly what it means to have Faith, and what Good Friday was all about. Without the Cross–and our daily crosses– there can be no joyous resurrection, no Easter. Our suffering has a purpose just as Jesus’s suffering had a purpose. We may not understand the purpose, but our all-knowing God does understand. And He will be with us through out.